(Nanowerk News) A team of Virginia Tech researchers has succeeded in transforming cellulose into starch, a process that has the potential to provide a previously untapped nutrient source from plants not traditionally thought of as food crops. Percvial Zhang Y.H. Percival Zhang, an associate professor of biological systems engineering in the College of Agriculture and Life Sciences and the College of Engineering, led a team of researchers in the project that could help feed a global population expected to swell to 9 billion by 2050. Starch is one of the most important components of the human diet and provides 20 to 40 percent of our daily caloric intake. The research was published this week in the Early Edition of the Proceedings of the National Academy of Sciences ("Enzymatic transformation of nonfood biomass to starch"). Cellulose is the supporting material in plant cell walls and is the most common carbohydrate on earth. This new development opens the door to the potential that food could be created from any plant, reducing the need for crops to be grown on valuable land that requires fertilizers, pesticides, and large amounts of water. The type of starch that Zhang’s team produced is amylose, a linear resistant starch that is not broken down in the digestion process and acts as a good source of dietary fiber. It has been proven to decrease the risk of obesity and diabetes. This discovery holds promise on many fronts beyond food systems. Zhang used a novel process involving cascading enzymes to transform cellulose into amylose starch. The new approach takes cellulose from non-food plant material, such as corn stover, converts about 30 percent to amylose, and hydrolyzes the remainder to glucose suitable for ethanol production. Corn stover consists of the stem, leaves, and husk of the corn plant remaining after ears of corn are harvested. However, the process works with cellulose from any plant. This bioprocess called “simultaneous enzymatic biotransformation and microbial fermentation” is easy to scale up for commercial production. It is environmentally friendly because it does not require expensive equipment, heat, or chemical reagents, and does not generate any waste. The key enzymes immobilized on the magnetic nanoparticles can easily be recycled using a magnetic force. Zhang designed the experiments and conceived the cellulose-to-starch concept. 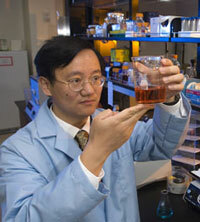 Zhang and Virginia Tech visiting scholar Hongge Chen are the inventors of the cellulose-to-starch biotransformation, which is covered under a provisional patent application. Chun You, a postdoctoral researcher from China at Virginia Tech, and Chen conducted most of the research work.